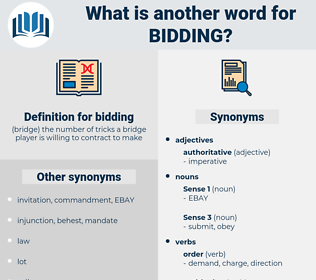 What is another word for bidding? coordinates, auctioning, tenderer, Underwriting, gambling, competition, offering, contract. Progressing, Proposing, Suggesting, competing, Displaying, Presenting, inviting, accompanying, advancing, appealing, appeals, Attracting, betting, Receiving, sending, Securing, Applying, Quoting, burying, mourning, Referring, Escorting, laying, Tendering, letting, auctioning, tender, offering. auction, Tendering, procurement, tender, subjugation, adjudication. Colonel Sandherr, at whose bidding he says he wrote it, is dead; but others who know a great deal about him are still alive. There are men round Mintaro who will do my bidding for money, no matter what it is I ask. 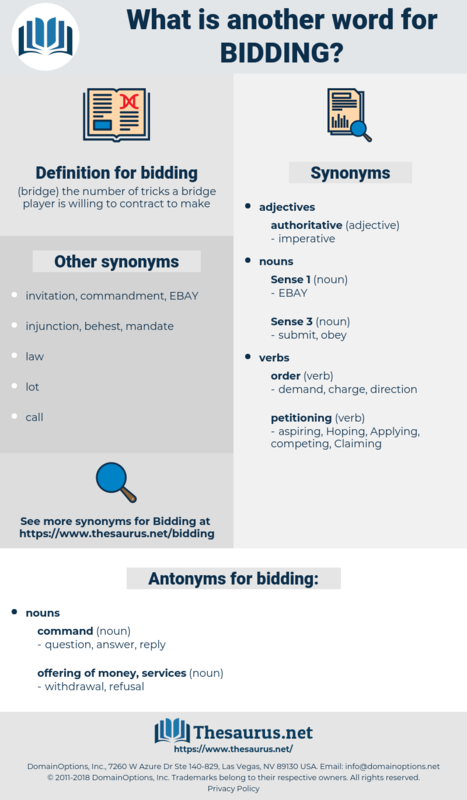 pre-empt, takeout, preempt, overcall, contract, preemptive bid, declaration, overbid.